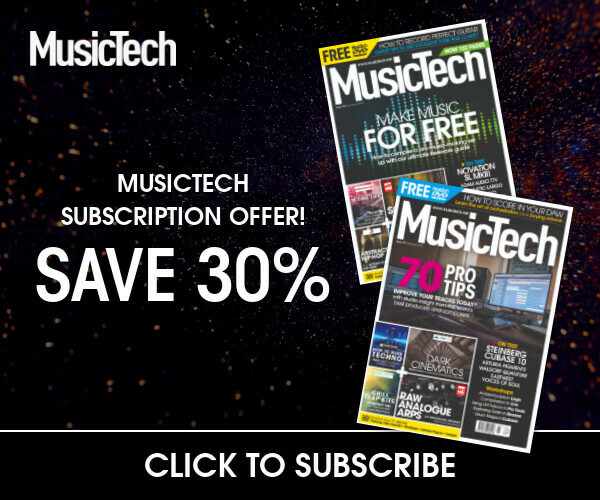 Want a new way to control your music? 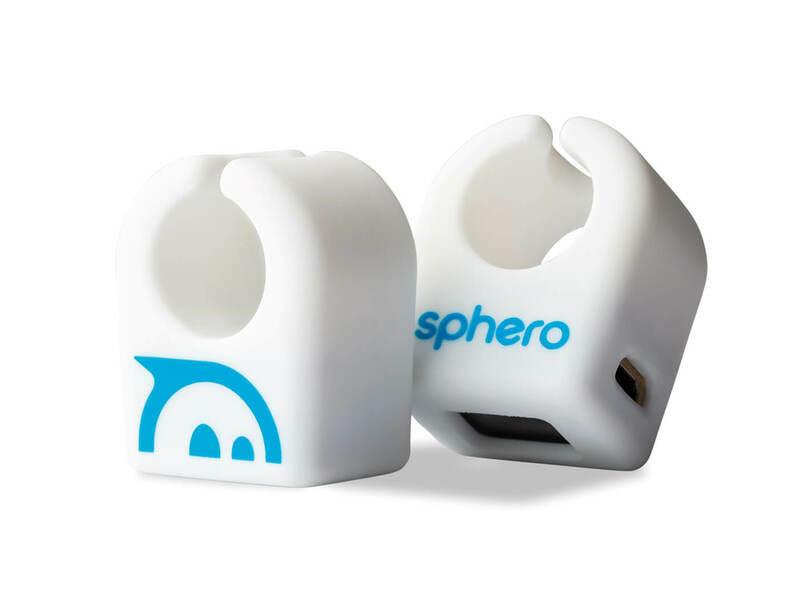 Look no further than these new Bluetooth triggers from Sphero. So much of electronic-music performance is about how you interact with it. You can trigger sounds with keys, touchscreens, joysticks, buttons, knobs, pads and more, so why limit yourself? This is where Sphero’s Specdrums could come in. 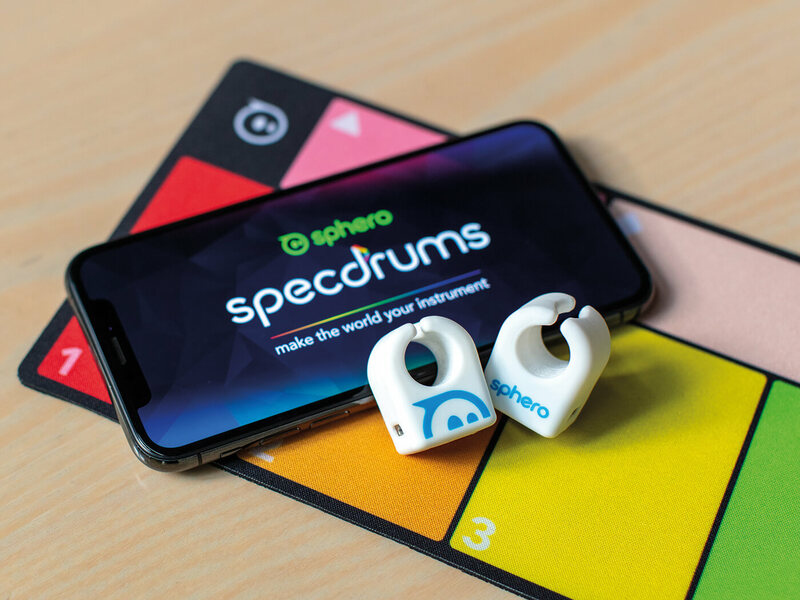 Sphero gave us those cute little ball-shaped robots (and the Disney/Star Wars variations), and now it has Specdrums – rings that wirelessly connect to your iOS or Android mobile device and trigger sounds when you tap on different-coloured surfaces. 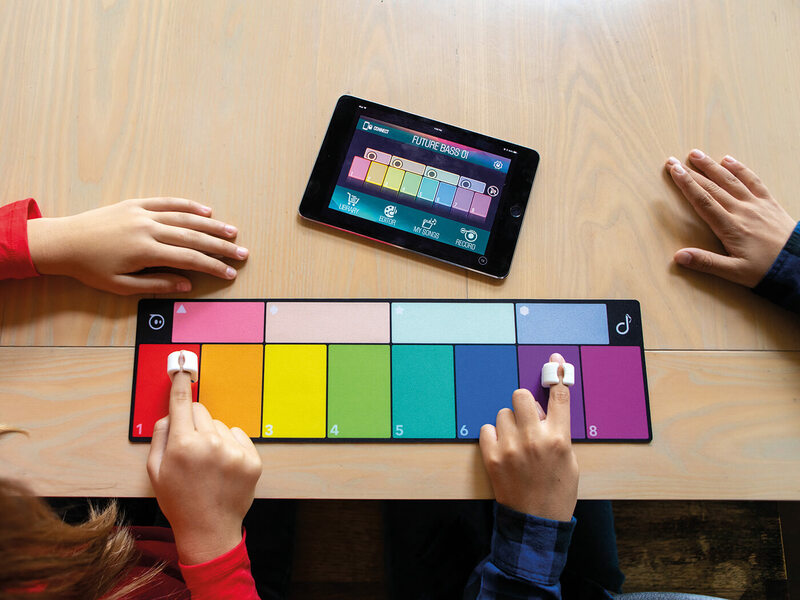 For educators and recreational users, that’s intriguing enough, but for more serious producers and performers, we’d need more, and Specdrums have it, because they’re Bluetooth MIDI devices. Specdrums are admirably clutter-free and fast to get going. The box contains either one or two rings, a short USB charge cable, a pouch and a colourful play pad. Start by downloading two free apps; the Specdrums app plays instrument parts using onboard sound packs in categories such as Keys, Synths, Strings, and Drums; while the Specdrums MIX app has a layout that conforms to the play pad, and is used for launching loops and one-shot samples. Setup is easy. Charge the ring (it’ll take around an hour to reach maximum charge, and that’ll give you over two hours play time), then use either app to handle Bluetooth pairing (supposedly you can connect up to 10 rings to one instance of the app). For a quick fix, put the play pad on the table and tap the business end of the ring on the coloured squares. Depending which app you’re using, they’ll trigger a collection of synced samples, or notes in a preconfigured scale. 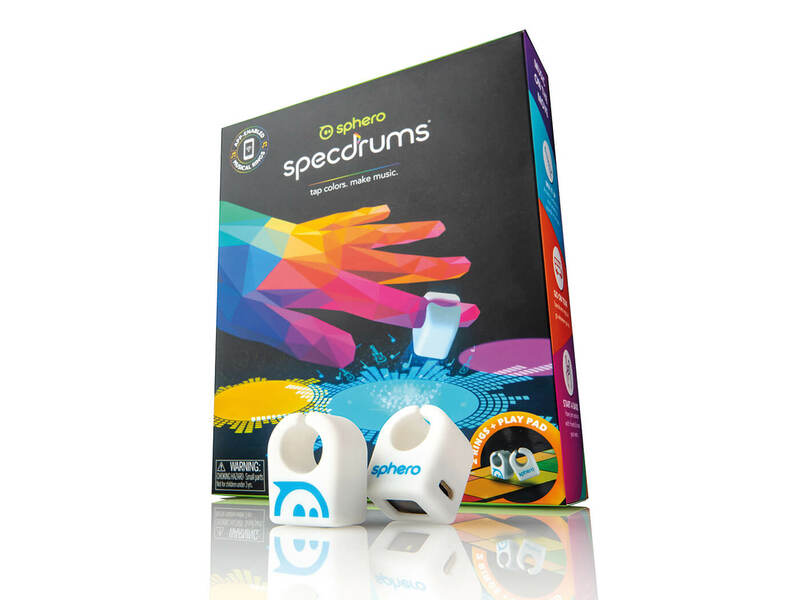 The Specdrums have a sensor with a little light that will illuminate the surface to ensure better colour recognition – that’s so you can use these in low-to-no-light situations. They work in conjunction with an accelerometer that detects a tap on a surface to trigger the sensor and light. The assembly uses ‘medical grade silicon’ as an outer skin and the whole thing seems quite rugged. Including the mat is a great idea, and the rings arrive partly charged (at least, mine did), so you can begin playing immediately. The MIX app is the easiest to get going with. It’s just tap and play, with an obvious visual relationship with the pad. You’ll quickly tire of that, though, and start exploring your environment in search of colours that’ll trigger the sounds. Everything around you becomes trigger-fodder – although the rings won’t work with colours on a computer screen because the white LED overwhelms the colour in the display. If you’ve got any fruit, try that – there’s something cute, absurd and fun about using a banana and an apple to launch beats. The MIX app includes an expandable library of sound packs, which when loaded, maps immediately to the pad/app configuration. There’s also a Record function so you can capture sounds through your device’s mic and trigger those with any colour you choose – just tap on the colour you want to assign. As well as recording and assigning samples, you can enter Record mode and record your jams as stereo mixes which you can send to other devices or apps. If you’re more interested in playing instruments, use the Specdrums app, where you can choose from a library of instrument sounds, and organise note and colour relationships, with user-definable scales and chords. This is one area where you’ll benefit from using more than one ring, perhaps even several with a group of players. The app also has a Record button, and you can switch and overdub different instrument sounds. I thought the Specdrums looked like fun straight off, but I got really interested when I realised that they work as Bluetooth MIDI controllers. That’s where it opens up for musicians, because as you will imagine, MIDI equals everything! The Specdrums can connect to MIDI apps running on the same iOS or Android device, but to any computer as well. You could even route them to any MIDI-compatible hardware connected to your computer. 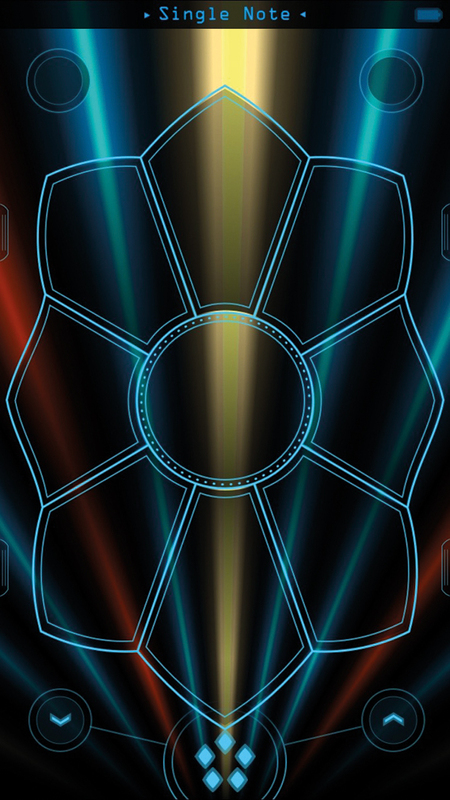 The only limitation at the moment is the inability to assign different MIDI channels or CCs to the rings. They pair just like any other Bluetooth device, and it’s great that you don’t need the mobile device as an intermediary. On my test MacBook Pro I had to use the Audio MIDI Setup utility to configure them, but no other special software was needed. Testing Specdrums with Ableton Live was an obvious choice – Live is so controller-friendly and easy to assign. They appear as regular MIDI devices in Live’s Preferences, and all you need do is load an instrument and start jamming, or enter MIDI Map Mode to use notes from the Specdrums to trigger one shot samples and loops, just like in the Specdrums MIX app itself. It helps to colour-code the relevant Live tracks and clips so they reflected the colours used to trigger the sounds and samples. This could be a whole new take on finger-drumming, but also a new way to trigger effects, scenes (horizontal rows of clips), even chains in effect racks. You could take it from there and explore options offered by MIDI-to-key command utilities, as well, or run VJ software such as RemixVideo. Specdrums are probably not complex enough to manage an entire live set, as things stand now, but if you put them alongside a more conventional controller, they bring something fresh to your performance proceedings. Entertaining as Specdrums are, there are a couple of additions I’d suggest for serious music use, like being able to set a different MIDI channel for each ring, and custom sample import into the iOS apps. 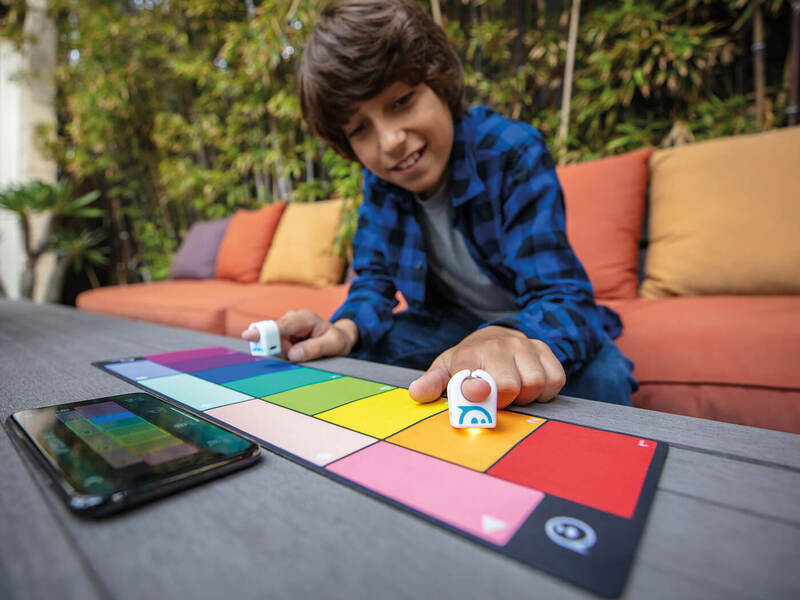 Sphero has already revealed that an update will bring velocity sensitivity by the end of spring 2019, which will be a fantastic addition for percussionists. The Specdrums are easy to set up, and fun to use, and if you’re open minded, they might provoke you to find new ways to play. Anybody working in music and arts education should check them out, and they’re a great way to introduce discussions about synaesthesia – where input to one sense (like sight) creates a response in another (like hearing). The Specdrums are very high-tech, but they feel organic and bring you back into the physical world, although I’d say you get the full benefit if you use two or more rings. For musicians, they’re a new angle on sample playback and performance – and thanks to MIDI, the applications are limitless. The Sphero Specdrums fall into the category of what you might call Marmite MIDI Machines – you’re bound to look at them and make a snap love/hate decision. Even while working on this review, I’ve seen people react with either total horror, or incredible enthusiasm. As far as I’m concerned, anything that gives us a different way to interact with our sound-making devices is a very good thing. The Specdrums may look like toys, but with the MIDI support it’s wide open – any software or hardware that can receive or translate MIDI notes is accessible. And that’s before we get to the educational angle, as these will be a great way to get kids excited about music, art, even literacy. And, you know, electronic-music creation doesn’t always have to be about backlit pads! 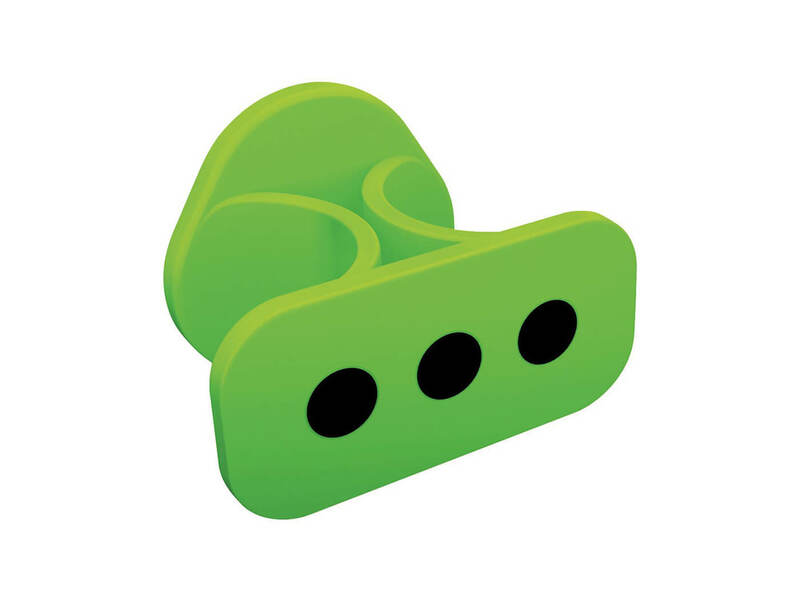 The iRing looks to be discontinued now, but you can still find some online. It’s similar to Specdrums: a pack of two rings that work with motion to control sound and effect parameters on iOS apps, or to send MIDI via iPhone to computer apps. A gesture-based MIDI control app for iPhone, AC Sabre has no onboard sounds so must be paired with a computer. It’s very flexible, and includes tools to add scales, harmonies, and arpeggios, pitch bend, even guitar-style chords. It’s easy to think of Specdrums as music toys – which they are – but musicians can also use them to get a new perspective on triggering sounds and organising live performances.